A while back I gave guitar lessons to a blind person via webcam. I had to tell him where each left hand finger goes and and on what string. He was a amazing student and worked incredibly hard. Teaching him gave me a lot to think about. 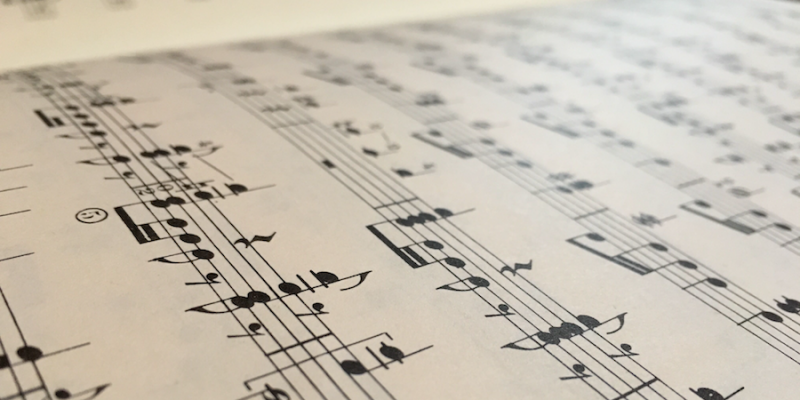 Specifically, what exactly do we take for granted when reading music off the page? How many little things do we miss because we’re used to them? Guitar music has more than one line going on. This is indicated with up and down stems in the music. Usually guitar music is in two or three voices, and sometimes four. Take a look at this Excerpt from Giuliani’s Op. 107. Three voices: The melody (up stemmed), the bass (down stemmed), and the middle voice (the half notes). Now seeing this is nice, but here’s the trick: You are responsible for respecting the rhythms in all voices. Not only that, but you have to differentiate between each voice in some way. The melody has to sign out, and the bass has to be precise. The middle voice should sit comfortably in the background. Looking at guitar music all the time might make you blind to the rich amount of information conveyed in the score. Pay attention to and shape each voice. Play each one separately, sing each one, and listen carefully. Texture refers to the relative thickness or thinness of the music as well as the resulting sound. Another way to think of it is how much black in is on the page. The Giuliani piece above has what sort of falls into the middle of the texture realm of the guitar. Compare that to this example from a Coste piece. That’s a lot of black ink — it has a thick texture. Texture is one of many tools in the composers tool box. Having more notes on the page may make that particular section more intense or it might indicated a climactic point in the composition. Texture can also give indications about form: sometimes the change in a piece that indicates a move to a new section is texture. A thick texture may also mean that you have to work harder to bring out certain voices (see number one). Texture is very easy to see, but very often overlooked. I love talking about musical forms because I think they’re incredibly important from a interpretive standpoint. Figuring out where to place ritenutos, rallentandos, and ritardandos, and figuring out how much of each a passage needs, has everything to do with form. Things like repeat signs and double bar lines are often visual cues about form. Don’t overlook them. Think carefully about what section is ending and how much of a ritard it requires. The end of a section should sound different than the end of a piece. Observe all the indications a score has to offer, even the less than obvious ones. “ritenutos, rallentandos, and ritardandos”, can you please explain the difference? A Ritenuto is an abrupt, short slowing of tempo. You could think of it like holding back on a note or two. Ritardando is a longer slowing of tempo, something you’d hear at the end of a phrase or section. Interestingly both Ritardando and Ritenuto can be abbreviated rit., which brings up a lot of questions when you’re looking a piece for the first time. Rallentando is an a long, drawn out slowing of tempo. Think of like the grandiose slow downs you hear at the end of symphonies, etc.